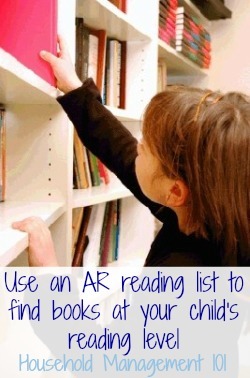 An AR reading list is a quick, easy, and free resource to help your child choose books to read that are at his or her current reading level, so they are not frustrated because the book is too hard or bored because the book is too easy. Once your children start to read on their own a whole new world opens up for them. If you have instilled the reading habit in your child, be prepared to visit the library a lot. You should also be prepared for this common problem for parents of young readers -- having no idea if the book they chose from the library is too hard or easy for them to read. Unless you have a degree in early childhood education it can be difficult to determine what reading level a book is geared toward, just by looking at the words and pictures. I have also found that even those books that have a guide on them, saying for example, reading level one, for beginner readers, vary widely in what that level means among different publishers (and sometimes in the same series). When your child reads books consistently at a reading level too low for them their reading skills do not progress. Obviously, a family favorite or an occasional lower level book does no harm, but your child needs to be mildly challenged, in general, to continue progressing forward with reading. On the other hand, if a child chooses a book too far above their current reading level they generally get very frustrated. This can lead to your child feeling negatively towards books or reading, and making the assumption that reading is too hard. As with much of life finding the right balance is key. AR stands for Accelerated Reader, which is a reading system used in many grade schools and created by Renaissance Learning. Basically, AR is a software assessment program which determines whether children have read certain books by asking them between 5-20 multiple choice questions about them. My children use this program in their school, which is what first made me aware of it. As part of the program there is an AR reading list comprising over 150,000 good quality children's books that have been assessed to determine their reading level. Further, unlike some other reading level systems, this one appears from my experience to be consistent, in that if the list says a book is in a reading level my child should be able to read, they generally can. Plus, the list does not contain special books only sold by one manufacturer or anything like that, but instead lists books that can be found at your local library. We even had several on our own bookshelves at home. *** Update: I used to use a written PDF list I would review online, but most schools have since stopped using this list, because even more books have been added. Below is the new way I use to find the reading level of various books, and get new ideas. Here is a link to a free website, called AR Book Find, which is a free resource you can use to find the level of various AR books. You can use the quick search feature to type in the name of a specific book and get it's book level, referred to as "BL." In addition, you can use the advanced search to find new ideas for books in a specific book level by sorting by "interest level" and then sorting by "book level." If those instructions don't make sense, just go to to the website and play around with it for a couple of minutes, and you'll quickly understand what I'm talking about. Since it is free, you can do as many searches as you want. My daughter has been reading Because of Winn-Dixie , which is quite a long book, and whose AR level is 3.9. It made me think she might be able to read Charlotte's Web , but I checked its level on the list quickly before I suggested it. It's level is 4.4. Because my daughter is going slowly and is stretching and growing to read the 3.9 level book, I decided to wait on that suggestion. Instead, we looked on the level list together for additional books in the 3.7-3.9 range that she could check out of the library. I have used this strategy several times to make sure we choose books that are right for her, and to get ideas of additional books she could choose from when I run out of ideas. Well, that strategy works for me, and I believe it can work for you too! Does A Messy House Make It Harder For Your Child To Learn To Read?